As we know the current is the flow of free electrons in a material from higher potential to the lower potential. During this flow, few of these electrons collide with other atoms in the material and lose their energy in the form of heat. These collisions cause a drop in potential across the material. The property of a material to resist the free flow of electrons through it is called resistance. It is denoted by R. Resistance of a material depends on its cross-sectional, length and relative permeability. where, ρ is the relative permeability of the material, l is the length of the material and A is its cross sectional area. According to ohm’s law, current flowing through a resistance is directly proportional to the voltage across it. I – Current flowing through it. When current flows through a conductor few electrons lose their energy due to collision with the atoms in it. The energy lost due to collision is dissipated in the form of heat. The unit of resistance is ohm and the unit of resistance is symbolically represented as Ω.
V is the voltage across the resistor and I is the current flowing through it. 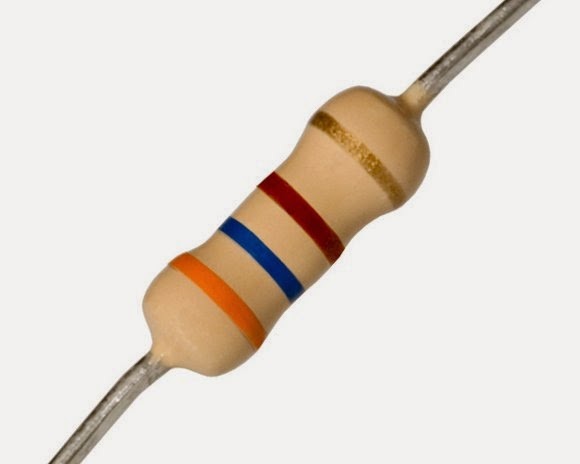 “V” is the voltage across the resistor, “I” is the current flowing through it and “t” is time in seconds. A 20 ohm resistance is connected across a 12V battery. Calculated the power lost and the energy lost in the circuit when it is kept closed for 3 minutes. If a resistance connected across a 6V battery allows a current of 0.2 ampere through it, find the value of resistance. From the above equation it is evident that in a series connection of resistances, the total resistance is equal to the sum of the individual resistances. From the above equation it is evident that when a set of resistances are connected in parallel then the reciprocal of equivalent resistance is equal to the sum of reciprocal of individual resistances.